A modern small computer desk for small spaces: fits virtually anywhere. 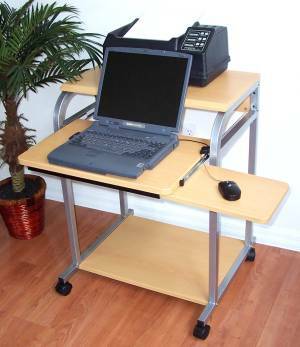 This narrow cart can hold a desktop or laptop computer or other office equipment (printer, scanner, copier, fax machine, ..). 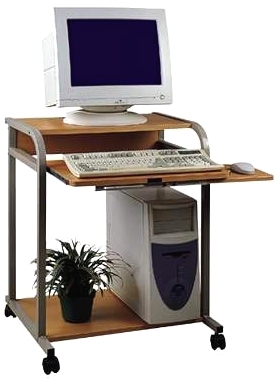 It can be sued as a mobile corner desk or a child computer desk. Fits in any small office, exam room, bedroom, etc.. It can be set next to a desk, table, or seating area. Fits in a closet. 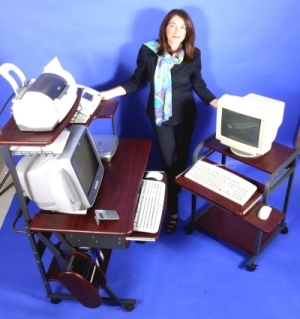 A real sturdy mobile laptop cart. Placing the laptop computer on the keyboard shelf you van achieve an ergonomic keyboard height. After use, just stow away the laptop by pushing in the sliding shelf . 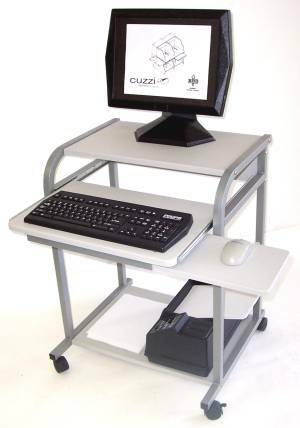 It's generous sliding keyboard shelf is often used to expand the literature or writing area.